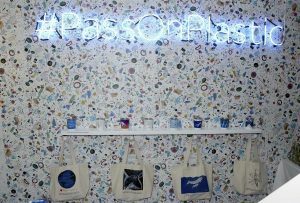 In a bid to inspire people to #PassOnPlastic, an immersive and exclusive ocean waste themed pop up, from the Project 0 team, has opened at 20 Beak Street in London’s iconic Carnaby. 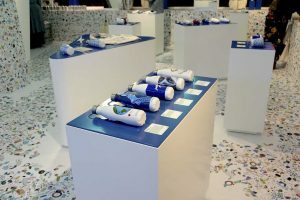 The experiential pop up showcases plastic themed art and sells a limited-edition reusable product range designed by ten eco-conscious and influential celebrities. The reusable range includes a water bottle, a coffee cup, a tote bag, an on-the-go cutlery set and a three-piece beeswax wrap set – an alternative to cling film, with each artwork created with a bespoke ocean-related design. Prices range from £15 – £25. Fearne Cotton hand-drew her design, intertwining beautiful sea creatures with the dangers of single-use plastic. on the magnificent sea creatures. their plight at the hands of single-use plastic to life. made up of single-use plastic products, showing the weight of the issue. HRH Princess Eugenie of York hand drew her design, issuing an inspirational call for change. The limited-edition product range follows shocking research by Sky Ocean Rescue revealing that the UK consumes 10.7bn single-use plastic bags, 14.1bn drinks bottles, more than 4bn hot drink cups, 1.5bn throwaway cutlery sets and 12.2bn single-use lunch packages in a single year. The new range aims to tackle these statistics by providing reusable versions of the five most common single-use plastic items currently contributing to the staggering amount of plastic entering our oceans. The pop up also features six artworks by food photographer, Tim Atkins, whose work demonstrates how easily micro plastic pollution enters seafood and ends up on our plates. Carnaby welcomed its own water refill station earlier this year. Located in foodie haven Kingly Court, the refill station encourages visitors to refuel their reusable bottles and work towards a ban on single-use plastic bottles.